Thanks to the team from Helikon Tex/Direct Action I am able to introduce the Direct Action Foxtrot Waistpack to you and take a closer look at the features of this bag. 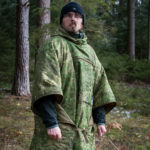 Observant readers of my reviews might know, that Helikon Tex introduced the products of the Direct Action line at the IWA in 2014 and since then has build up its range of products continuously. By now Direct Action is acting as a separate brand with an appropriate web presence. The Foxtrot Waistpack has been available for quite some time now in different colors and camouflage patterns. Reason enough to take a closer look at the bag. Black, OD, PL Woodland, Coyote, Camogrom, Ranger Green, Pencott Badlands and Snowdrift. The main compartment is accessible from the top. On the sides you can find a cargo and a water bottle pocket. At the forefront there is a larger pouch which can be opened from the top and also features a separate panel to the front. Both are closed by zippers. The bag has a dedicated waist belt which cannot be removed but stored behind the padding. The belt also features small panels. There is also a carrying handle and sling attached to the bag. The waistbelt as well as the back of the bag feature Direct Action’s patented “combat ventilation system”. Let’s start with the forefront. The pouch features laser cut Molle slits at the outside, as well as a small velcro area for patches or insignia. I have already written about the pro’s and con’s of this system (+ better working camo patterns, reduction of weight; – room for dirt and debris behind the material). The MOLLE offers 3 rows and 6 channels to work with. Via ykk zipper there is access to a small panel at the front, which has enough room for papers, documents or flat objects. The cargo pouch on the side also offers the laser cut MOLLE slits (3 rows, 2 channels) and can be opened for about 505 with a zipper. In it you can find a mesh pocket and a keyfob. There is also a drain hole at the bottom. This is the designation by Direct Action/Helikon Tex. In fact there is only room for small cans and bottles, but nothing big like a standard Nalgene oder Sigg bottle. Two rifle magazine are fitting inside but they can’t be secured with the detachable velcro strap. What can fit into it without problems are small cases for glasses or transport boxes by Peli or Otter etc. There is also a drainhole in this pouch. At the top of the main compartment you can find a net of shock cord which is laced through various flaps. This way you can secure a light jacket and make it readily accessible. Personally I have also used it as a means to stow away my dogs leash when he is running around freely. On the left and right of the top there are two straps which can be connected to serve as carrying handle, as you know it from carrying bags. As practical this might seem it also has the disadvantage of getting in the way if you want to get into the main compartment while the carrying handles are connected. Nevertheless this feature comes in handy (quite literally) if you are carrying a heavier load. The following feature could be added to the top lid, but since you can find it on the inside I decided to put it here. The top features a mesh pocket, which can be accessed with a ykk zipper and can be used for items you need to identify and get to quickly. The main compartment itself is completely lined with loop velcro and has a dedicated panel at the back where you can put tablets and the like without problems. This panel, the backside of the main compartment and the bottom is padded quite well. Also there is NO drain hole. The main compartment is not roomy enough for documents with an A4 format. The bag itself is not designed for something like that but I mention this because this question always comes up and I also think that this is a good size reference of the bag. The waistbelt consist of two large padded wings which offer each 3 rows and 4 channels laser cut MOLLE slits and also a panel each which can be closed with a zipper. There are large Duraflex buckles on the belt. With this system you can bring the bag close to the body and transfer the weight of it directly to your hip. This way the actual strap for carrying gets relieved and only serves as a vertical safeguard. The padding of the back of the bag has a channel where you can hide the waistbelt. This way the bag serves more like a carrying bag. The only disadvantage is that this way the bag becomes very bulky. Everyone has to decide for himself how to think of this. The strap is a basic nylon strap with thick Duraflex buckles at its ends. The carrying comfort is assured through a padded shoulder pad made out of a rubberized material. This pad stays adamantine at its place while the strap itself can pass through it unhindered. 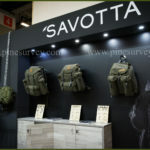 As with the backpacks of the Direct Action line, the company also equipped the Foxtrot bag with the patented “Combat Vent System”, which is made out of foam material with holes, that is also waved and runs diagonally to the sides. This way maximum air circulation should be guaranteed. The Foxtrot bag has additional padding on the inside of the main compartment. Together we are looking at nearly 3 cm of padding. If this was designed differently you could decrease bulk and weight. As with other Direct Action products the manufacture is exquisite. In that regard there surely is no complaint possible. The zippers are equipped with zipperpulls, the cord is run through tubing and secured with matching zippcords. The bag offers enough room for a box of ammunition, ear protection, magazines and separated from them a compartment for your handgun. With the help of velcro accessories there are also further ways to individualise the bag. The outer pouches and the top lid can be used for additional items like glasses, documents and notes. As you can see there is also enough room for ammo or magazines. The AK47 mags were the largest available to me. With this loadout I was still able to close the bag. Needless to say the mesh compartment in the top lid has to be empty for this. Other magazines with smaller specs have more room in the bag of course. AK74, AR15, AUG etc should not be a Problem. With the weight distribution of the waistbelt there should also be no problem to carry such a load more comfortable than with other bags. The every day items or the minimum you carry with you should have room as well. Organizers, knives, a shemagh and small items. (Alright, I am an exception because I always carry way to much stuff with me, but there are people who can work with less). The most favorable use for me is as a camera bag. With additional velcro dividers you could establish more organisation, but a DSLR should find room with two lenses. The other pouches and pockets offer room and possibilities for the rest of the equipment (cables, batteries, accessories). Using the waistbelt you can bring the bag to the front from the behind 5 o’clock position and get access to the main compartment. Please note that this examples are the products of my own thinking process. Depending on the user and the different experiences this views can differ extensively. For example: A very good friend of mine who takes pictures for workfor a very long time now would not use this bag as a camera bag while still recognizing its elaborate design. My very first scepsis has transformed to a positive stance in regard to the bag. It has a solid place in my every day use: as a camera bag, or for the pure essentials during a longer march with my dog, or even the drive to the shooting range. The look of the bag is not too „tactical“ for not using it in a civilian environment – assuming you are using a solid color like black or shadow grey (which should be available very soon) and not a camouflage pattern. Some critical points I would like to mention: One would be the attempt by Helikon Tex/Direct Action to add as much features into the design as possible to maximise the various ways to use the bag. Sometimes less is more. For example the padding at the back of the bag which consumes a lot of room and weight. The bag should be available at all shops carrying Helikon at a price range from 65 to 85€ depending on color and camo pattern. To conclude I would like to thank you for reading and also Helikon Tex/Direct Action for giving me the chance for this review.